HyperDeck Shuttle 2 SSD Video Recorder is rated 4.0 out of 5 by 83. Rated 4 out of 5 by Trey from Great Tool! Pros: Uncompressed, 10-bit amazing quality video. DNxHD workflow, awesome with Avid. HD-SDI pro connection. Playback options are versatile with HDMI also included. Easy to use. Cons: Battery only lasts for about an hour. Heats up pretty quickly, so you need to be careful not to overheat. Mounting is kind of silly, especially for the price of the plate. However, after writing that, I'd like to mention this: it's my favorite tool in my camera bag! I love it. I love the quality it produces, and it far exceeded my expectations, and outweighs the cons in my book. NOTE: Make sure you get an SDI to DIN cable. And make sure you get an SSD that is pre-approved by Blackmagic. Rated 5 out of 5 by James H. from Great addition to my EX1 I purchased the HypderDeck Shuttle to record uncompressed 10-bit 4:2:2 out of my Sony EX1 for green screen and compositing work. So far, I've been impressed with how easy it is to use. I wish it had a lighter weight and less expensive option for mounting as a mount that is 1/3 the price of the device is a little steep in my opinion. Was able to get the EX1 to trigger the recorder so I could record to both SxS cards and the SSD. Rated 2 out of 5 by RR from Beware of the mini-SDI connectors I have used this minimally, mainly for a recent 10 day shoot. I was testing an HDMI to SDI converter with it on a shoulder rig and the the connector came off with the SDI cable. This was a light use situation. BMD is evaluating whether they are able/ willing to fix. They claim that this hasn't come up much, but the comments here indicate otherwise. A good product otherwise, but if you buy, figure out some way to ease the stress on those connectors. I don't think they're ready for field work. Rated 5 out of 5 by Coopaloop from A Pretty Solid Product We use this to capture a 4 camera Church Service. 3 cameras go from our switcher directly to individual Hyperdeck Shuttles. A final Hyperdeck captures the overall key feed from our switcher. After 2 weeks of use the product has proved reliable. Hopefully this will not change. Solid build. Easy to use interface. Easy to configure on a computer. The Hyperdeck shuttle can capture in Apple Prores 422HQ, Quicktime uncompressed, and DNxHD codecs. I wish it would capture in ProRes422, which would be smaller and more managable, but of course the ProRes codec I use to capture is of very good quality. Rated 4 out of 5 by Kristoffer from Be sure it's compatible with your gear The construction build feel great, it's solid and everything. The lack of a little screen to change directly the settings (video format) could be annoying but normally, you don't change that often. But be sure to check if your camera can output the signal you want to record correctly. You do not set fps and interlaced/progressive mode inside this device, you have to set this in the camera that will output the signal through the HDMI port. I was buying this thinking I could do RAW recording from a 4 years old pretty good Sony camera but I end up being stuck with 29.97fps and 1080i, not configurable. Rated 5 out of 5 by John S. from Beautiful and solid design. A dream. I opened the box and tried the HyperDeck Shuttle 2 with my old Canon HV20. Minutes later I was viewing the test footage in Avid Media Composer. I am awaiting the release of the Canon 5D Mark III firmware update (April 2013) so I can capture clean HDMI into uncompressed 4:2:2 or to DNxHD format depending on my needs. I do green screen special effects for fun on low budget films and can't wait. The ONLY thing I haven't loved about the Shuttle 2 is that the SDI connectors protrude slightly from the side from the otherwise sleek design. I'll just be careful not to let them snag on anything. Rated 3 out of 5 by Alexa User from Works... Awesome Product but still has much room for improvement. Doesn't see SDI record trigger from Arri Alexa and only records the highest quality .MXF files... great if your using a DSLR or camcorder but bad if you plan on using this to generate offline files. Overall it seems like it can be a powerful tool and its downright cheap when you look at the other options out there I just hope Blackmagic gets it together and adds more codecs and Arri Alexa support soon. Please note, I have not tried to edit with these files yet. I don't know if anything funky is going on w the pulldown, etc. Hi there, Can I record 4k videos with the Blackmagic Design HyperDeck Shuttle 2 SSD Video Recorder ? Unfortunately not. 1080p is the highest resolution you can capture with this product. 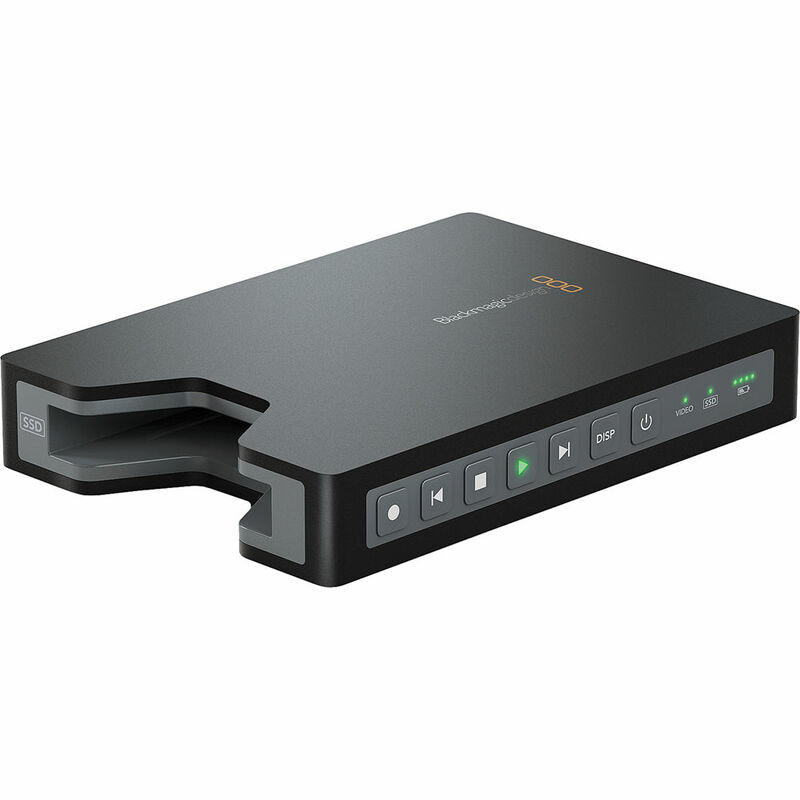 Can I record 4K videos with the Blackmagic Design HyperDeck Shuttle 2 SSD Video Recorder ? what are the system requirements for this unit on Mac, OS 10.7 and newer? This machine is system agnostic and works in any version of Mac OS X and PC Windows. How do you mount this to a rig? How big are the compressed pro res files when finished how much file size am I actually saving? Without knowing the numbers of your workflow, it is not possible to state exactly. But by using a quality compressed file such as ProRes or DNX, you can get up to 3-4 times as much recording time as against shooting RAW. Will this record 1080p in 24fps or 23.98 in DNxHD? Yes it will. The HyperDeck Shuttle 2 supports both 1080p23.98 and 1080p24 and can record in DNxHD. Noise after rec with BlackMagic is better? I got a Canon XLH1, thanks. The recording being digital will not add any noise, audio or video, to what is coming from the camera. what size are the pro res files after compression is done? File sizes vary as to ProRes type, resolution, frame rate and length. There are some good calculators on the Internet that may be used.